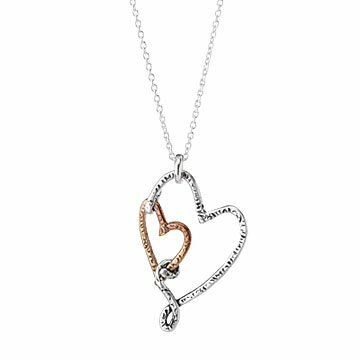 This mixed metal necklace serves as a stylish reminder of a treasured relationship. Anybody who's ever loved another person deeply understands exactly what e.e. cummings meant when he wrote, "I carry your heart with me (I carry it in my heart)." California artist Trudy James brings that idea to life with her Heart to Heart necklace, which features a sterling silver heart cradling a smaller bronze heart on an 18-inch cable chain. Whether it represents romance, a relationship between parent and child, or another strong emotional bond, this textured mixed-metal piece conveys enduring love and protection, and will inevitably remind the wearer of the person she holds most dear. Chain imported from Italy; pendant handmade in San Diego, California. Make it a set! Click here to see the matching Heart to Heart Earrings . Sterling silver and bronze naturally oxidize over time when exposed to air and any corrosive materials. Polish with a jewelers cloth when necessary. Silver and brass hearts, beautiful Italian chain - 18", just the right length. She loved the piece and thought the meaning behind it was very special as she is to me.